12-8 months ahead of the wedding is a really relaxed time frame but don’t worry as we’ve been known to look after a bride just days before her big day! To ensure we can deliver the fabulous experience you would expect from a leading bridal gown studio we are an appointment only service. This allows you the time and privacy to find your perfect wedding dress with your nearest and dearest. We highly recommend that you keep your guests to a maximum of two or three for the first appointment. This will ensure your visit is a more intimate, calm and comfortable experience in which we can truly help you. Too many opinions can often confuse a bride. When you find your dream dress you are welcome to show your bridesmaids and other guests on another appointment. We also ask that children are not brought to the appointment as we want your focus to be on enjoying your visit and the time being all about you. What sizes do you stock for trying on? Most of our dress samples are size 12-14 but we do have beautiful dress samples available in sizes 8-30. We also stock a range specializing in sizes 14-32 which we have an array of different samples to try on. Is there anywhere for me to park? Yes, there is a large free carpark to the front of the studio with no time restriction taking away another stress from your appointment. Appointments usually last for 1 and half hours but can go on slightly longer if we have time. We feel this is plenty of time to try on all the dresses you like and gives you an opportunity to retry on any favourites with accessories. I have a found a dress by one of your designers that you don’t carry it. Is it possible to still order this dress? Yes of course! You can order any of the styles by any of our designers. You can try on similar styles that we have in the studio to get an idea of fit and quality. 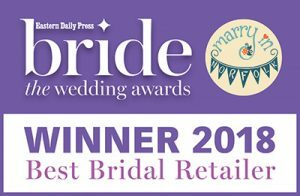 For those dresses not currently carried as stock we are pleased to offer a ‘Sample Service’ with our designers of Allure, Allure Romance, Christine Dando, Ella Rosa and Callista dresses. This means we can have your chosen style available for your appointment. There is a small fee to cover the insurance and postage which is refunded on purchase of the chosen dress. Dresses can vary from 12 weeks to arrive to 24 weeks depending on the designer and the complexities involved. A number of the dresses are available ‘off the peg’ if you have time restrictions but 18-22 weeks is typical. Some of our designers offer a rush order service at a small cost. Don’t forget to allow time for adjustments in addition to the dress ordering time. Some brides order at the same time as ordering the dress but if you are still deciding then you can order at the time of collecting your dress as these only take a few weeks to be delivered. Do I need to purchase my dress from you to buy accessories? No of course not, just let us know you would like an appointment to try accessories, we have a range of hoops, veils, jewellry, hair accessories and even storage boxes to keep your dress safe. 50% deposit at the time of ordering and then the final 50% on collection. We offer an Interest Free Payment Plan to help our clients spread the cost of their bridal apparel into monthly flexible payments. We ask for a 30% deposit at the time of ordering and then we agree a monthly payment and then ask for the final balance to be paid on collection. What if my dress is late? The delivery date is only estimated due to the nature of producing these highly detailed gowns and delays in production or customs are possible. We constantly track the progress of all the dresses, if we know a dress may be running a little slower than expected we will contact you to let you know, but we always allow plenty of time between the expected delivery date and the date of your wedding. We will call you to let you know we have received your dress in the studio and arrange a convenient appointment for you to try it on, we ask this is within 2/3 of it arriving in store. You can bring with you any shoes or accessories you have brought. Once the final payment is made you will be able to home your dress in one of our breathable dress bags.